Hi guys! It's almost Thanksgiving! I'll probably be taking the rest of the week off to visit with my family. I will definitely be lounging around and eating way too much food. Make sure to check your social media pages often because there will be plenty of Black Friday sales going on. I'll have the Zoya Holiday 2018 collection up soon, as well as some swatches from Starlight and Sparkles. The polishes I have for you tonight cannot be found on the Emily de Molly site because they are group customs. You'll need to join the Emily de Molly Fan Group on Facebook to find the links to purchase them (they are $10 apiece). Hayley said they will be available for several months, so you should have plenty of time before they go away. Shall we get to it? What I love most about Emily de Molly polishes is her combination of textures and finishes. Hayley can add holo, flakies, glitter, and shimmer to one polish and make it just work. 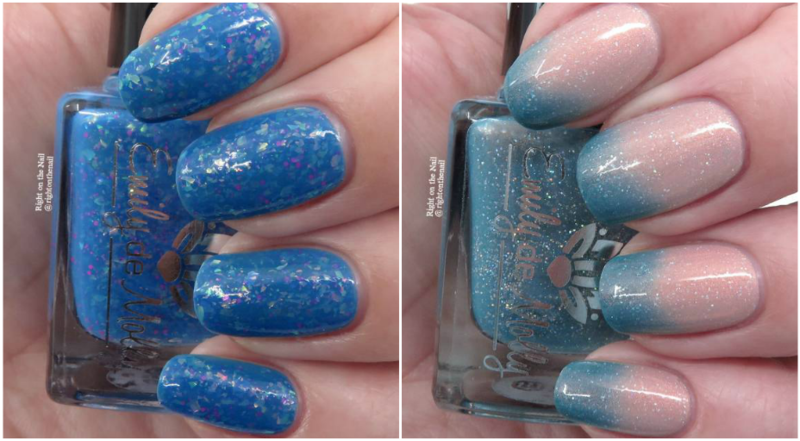 Opal Illusion is a bright cerulean jelly base with multi-colored iridescent flakes and pink neon glitters. I expected to use 3 coats for this one, but I was surprised by how well it built up in 2. It dried with a little bit of texture that a simple coat of topcoat smoothed out completely. I was instantly drawn to Symbiosis due to the striking contrast of cold vs warm states. It's a peach (warm) to light blue (cold) thermal with copper shimmer and silver holo microglitters. This one transitions quickly and with ease. I don't have anything like it, and I appreciate the addition of the holo sparks. Again, I only had to use 2 thicker coats to make this full-coverage. I've found that pretty much all of my Emily de Molly polishes are 2-coaters. While I loved both of these, I'd say Symbiosis is the "must-have" shade of the 2. If you can pick up both of them, do it! I've purchased over a dozen Emily de Molly shades over the past 3-4 months, and they are definitely some of my new favorites. Make sure to get over to the Emily de Molly Fan Group to get the links for these. You can find out more about Emily de Molly on their US/international website, AU website, Facebook, Instagram, or Twitter pages.